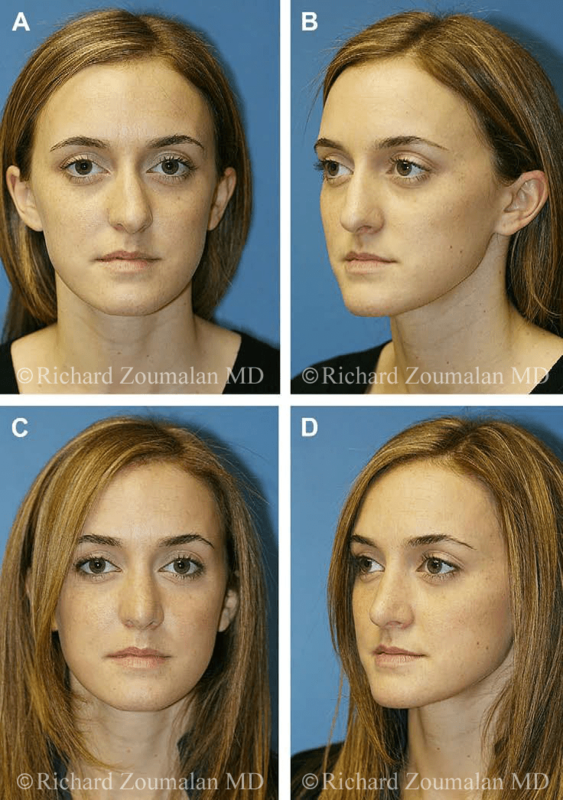 The deviated dorsum creates the appearance of a twisted, asymmetric, or deviated nose. This situation may create functional and aesthetic issues that require correction.1,2 Correction of the dorsal deviation may present itself as a challenge to the rhinoplasty surgeon. The dorsum is a complex three-dimensional structure in which correcting a functional issue may have an impact on cosmesis and cosmetic correction may impair nasal function. Therefore, any attempt at straightening a dorsum should strive to maximize cosmetic outcome and maintain or improve nasal function. This can be a difficult task for the surgeon. Deviations range from a subtle ‘‘C’’-shaped deformity to a severe twisted nose deformity. Systematic facial analysis and evaluation of the dorsum are critical to correcting a deformity of this type. Such an analysis is complicated by the fact that most faces, on close examination, are vertically or horizontally asymmetric. As such, aligning the nose perfectly with one side or half of the face may not make it symmetric with respect to the other side. For example, the inferior third of the face may not lie in direct midline alignment with the upper third of the face. Hence, making a dorsum that bisects those two midline points results in a nose angled to one side. These imperfections and asymmetries should be pointed out to the patient before any surgery. Perhaps the only consistent reference point for an frontal or anterior-posterior (A-P) photograph is the center point between the medial canthi on the nose with the head in the Frankfort plane. 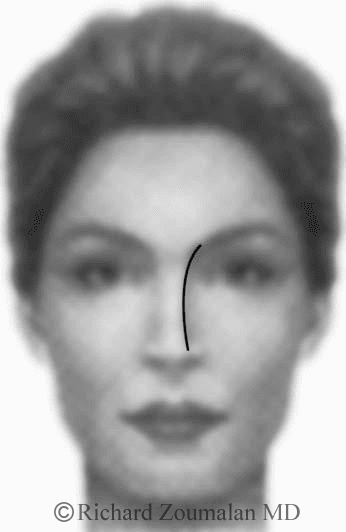 The other facial landmarks tend to be ineffective for analysis of dorsal symmetry because of facial asymmetries.8 A straight line is drawn from pupil to pupil. The center point between the medial canthi is marked. From this point, a straight midline vertical line is dropped intersecting the glabella, nasal dorsum, tip,columellar base, nasal spine, philtrum, upper incisors, and menton.9 Fig. 1 shows a patient with a very minimal upper third nasal deviation. In such cases where the deviation is subtle/minimal, a vertical line dropped from the centerpoint between the medial canthi or pupils can more clearly show this. Additionally, the rhinoplasty surgeon should analyze the patient’s brow-aesthetic line on the A-P photograph. The nasal width should provide a graceful curvilinear line from brow to nasal tip. Deviation of the dorsum alters the brow-tip aesthetic and affects the contour of this line.10 Fig. 2 shows an appropriate brow-tip aesthetic line for a patient with a straight nose. The upper, middle, and lower thirds of the dorsum are each analyzed independently and then together as a whole.11,12 The upper third is composed of the nasal bones and the ascending process of the maxilla. The middle third is composed of the dorsal septum fused in the midline to the paired upper lateral cartilages. The lower third is the nasal tip, which includes the lower lateral cartilages, caudal septum, and alar base. Each third is recorded as being deviated to the left or right. It is clinically significant whether the upper, middle, or lower third is deviated because the surgical management of each third of the vault has its own set of maneuvers to straighten it. Fig.1. To appreciate a patient’s deviation better, a vertical line can be drawn from the center point between the pupils or medial canthi. In this article, the surgical approach to the deviated nose is based on this principle of thirds. Fig. 3A, B shows a patient with dorsal deviation to the left. The upper third (nasal bones) is not deviated. The middle and lower thirds of the nose are deviated to the right, however. Fig. 3C, D shows the patient after surgical straightening of the nose. These photographs were taken 6 months after surgery. Treatment of the deviated upper third is tailored to the upper third deformity. The nasal bones as a unit may be twisted to the side, but the ascending processes of the maxilla are uninvolved. There may be a fracture (rare) of the entire bony complex unit to one side. More commonly, there are variations on those extremes. The treatment is osteotomies, and the specific osteotomy is based on the identified abnormality. Deviation of the bony pyramid is corrected with osteotomies made at specific locations along the vertical plane of the bones, depending on the location of bony deviation. Once the bony dorsum is mobilized, it may be manipulated and straightened, and occasionally stented. Osteotomies may be performed in a variety of ways. Fig. 3. (A, B) Dorsal deviation of the middle and lower thirds to the left. The upper third is relatively straight. (C, D) Six months after surgical correction of the deviation. They can be performed using a continuous technique, which is the most common method used. In this type of osteotomy, the cuts are made in a continuous fashion, through the nasal sidewall. Osteotomies can also be performed in a perforating fashion, which is a postage stamp type of sequential fracture using a narrow osteotome (2–3 mm). Osteotomies can also be performed by means of percutaneous perforations, which are also performed with a narrow osteotome. The type of osteotomy is insignificant as long as there is a cut through the bone that allows sufficient bone movement for the bony pyramid to be shifted to midline. Lateral osteotomies are ideally performed in a high-low-high fashion. The initial part of the osteotomy begins at the pyriform aperture (high point) and travels laterally toward the ipsilateral eye. As the osteotomy nears the nasal process of the maxilla (low point), it travels cephalically and medially toward a point just medial to the medial canthus (high point). Medial osteotomies are performed in addition to lateral (occasionally intermediate) osteotomies to allow increased mobility before manipulation of the bones. A combination of osteotomies is usually sufficient to bring the bones back to midline; however, lateral osteotomies alone may suffice. Medial osteotomies are performed by making osteotomies that begin just lateral to the septal insertion into the underside of the nasal bones. These osteotomies are aimed laterally to avoid rocker deformity. Unilateral osteotomies can be performed in certain situations. The surgeon must be open to ways to reshape the upper third, including not only unilateral osteotomy but outfracture of nasal bones after osteotomy. The usual strategy of the facial plastic surgeon is to infracture nasal bones before trying to realign the nasal vault. In certain circumstances of severe deviation attributable to fracture, however, the pyramid is so deviated that a portion of bone must be outfractured. In severe cases of deviation, a cross-root (or transverse-root) osteotomy can be performed. In this maneuver, a 2-mm osteotome can be used to make perforated percutaneous osteotomies in a horizontal fashion across the nasion, or just inferior to the nasal root. This series of perforations should connect the most cephalic aspect of the lateral osteotomies. This maneuver should provide tremendous mobility when combined with medial and lateral osteotomies. The bony dorsum can then be manipulated and molded with the opposite hand into place. This maneuver is usually used when medial and lateral osteotomies are insufficient in providing the mobility required for straightening. Straightening the middle third of a deviated dorsum can prove quite challenging. Minor concavities of the middle third can be addressed with onlay cartilage grafts placed in precise pockets or directly sutured onto the depression using an external rhinoplasty approach. Such onlay grafts do not improve nasal function and airflow, however, but are primarily for cosmetic improvement.15 Management of a more severely deviated middle third requires more aggressive maneuvers to straighten the septum and the paired upper lateral cartilages to which it is fused in the midline.16,17 Reorientation of the middle third should be performed subsequent to osteotomies so that the nose does not shift back toward the deviated position. 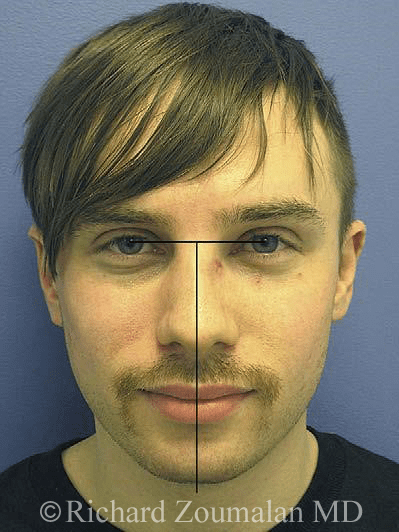 Integral to the management of middle third deviation is straightening the dorsal septum. This can be done in several ways. Septoplasty alone may be all that is needed and can be performed by means of a Killian, transfixion, hemitransfixion, or external rhinoplasty technique. Severe deviations sometimes require that the upper lateral cartilages be detached from the septum by means of an external rhinoplasty approach with open septal reconstruction. This view delivers unparalleled septal exposure, allowing for a more complicated and involved operation to straighten or replace the septum if need be. The septum can be scored on its concave surface to help release the spring and allow it to be straightened. Scoring is not effective unless there is some type of dorsal and caudal support allowing the septum to stay in position after scoring. The cartilage still has some memory and strength, causing it to return to its original position. Portions of cartilage can be removed, but care must be taken to preserve 8 to 10 mm of dorsal and caudal septum to prevent saddle deformity attributable to septal weakening and collapse. The spreader graft has become the ‘‘workhorse’’ graft for straightening of the middle third. Sheen17 conceived the spreader graft a means of improving the transition between bone and cartilage and opening the internal nasal valve. This graft is placed in a pocket between the dorsal septum and the upper lateral cartilages. Spreader grafts can act to address concavities by augmenting the concave size.14 They can also address the deviated dorsal septum by acting as a splint. Spreader grafts are perhaps the most difficult of all grafts to be placed by means of an endonasal approach. Although the open approach facilitates an easier insertion, an endonasal approach is used by the senior author (PJM) in many instances. In cases of airway obstruction, the endonasal approach is ideal for placement of the graft. The submucosal placement offers the maximal opening of the internal nasal valve. A precise pocket is created along the lateral dorsum between the dorsal septum and upper lateral cartilages. A small freer is used to elevate the small pocket. If placed correctly, the graft should push the upper lateral cartilage laterally. Suture placement is not required if the pocket is precise. In a severely deviated middle third, disarticulation of the upper lateral cartilages may be necessary because of traumatic upper lateral cartilage avulsions. It may also help to visualize the deviated dorsal septum. In this instance, the placement of the spreader graft is best placed extramucosally. This can be challenging using an endonasal technique. A converse retractor is used to elevate the soft tissues over the dorsum. The upper lateral cartilage is disarticulated from the nasal septum with careful effort to stay extramucosal. The fashioned spreader graft is placed in the pocket and sutured with 4–0 polydioxanone (PDS) suture. In patients with severe deviation or fracture that cannot be effectively straightened using grafts and scoring, reconstruction of a large portion of the septal structure may be performed. Subtotal reconstruction of the cartilaginous dorsum is an effective tool for severe septal deviation or fracture not amenable to scoring or cartilaginous reinforcement. This procedure requires an open approach and a large piece of cartilage for harvest. If this is not available, auricular or costal cartilage harvest is recommended. The authors prefer to use autogenous cartilage for restructuring and reinforcing the nasal septum. The three options for autogenous cartilage are nasal septum, auricular cartilage, and costal cartilage. The authors prefer to use nasal septal cartilage because of ease of harvest and use. If septal cartilage is not available or is insufficient, conchal cartilage can be a good graft site. At times, however, there is not sufficient cartilage from the septum or ear or the cartilage is not sturdy enough for the needs of the patient. In this case, costal cartilage is harvested. Septal deviation may not only cause dorsal deviation but nasal obstruction by its intrusion on the normal airway. Deviation of the lower third is most commonly attributable to caudal septal deflection. The caudal septum is a critical structure providing support to the tip of the nose. Because the septum is situated between the lower lateral cartilages in the midline, deviation of it has a tendency to deviate the lower third dorsum to the right or the left. Mild caudal septal deflections may be treated with a ‘‘swinging door’’ technique. In this maneuver, the caudal septum is freed down to the maxillary spine, ‘‘flipped’’ to the other side of the spine, and sutured to periosteum to fix it. Normally, a pocket is created between the medial crura to accommodate the caudal septum in its new position. If necessary, a small margin of caudal septum is excised at its inferior margin to permit its ‘‘swing’’ to the contralateral side of the nasal spine. The concave side of the septum can be scored to straighten it and to decrease its tendency to ‘‘spring back’’ into its previous position as a result of memory of the cartilage. In more severe cases, the caudal septum may need a more complex correction with removal and replacement with autogenous cartilage from the auricle or rib. This septal graft is then secured to the remnant of the quadrangular cartilage, the anterior nasal spine, and between the lower lateral cartilages. The deviated nose is a complex problem with a variety of solutions. A simple approach for the deviated dorsum with surgical relevance is thinking of the nose as being divided into thirds. Tailoring maneuvers to alleviate problems in each specific third helps the surgeon deal with deviations in an effective and straightforward manner. Johnson CM Jr, Anderson JR. The deviated nose—its correction. Laryngoscope 1977;87(10 Pt 1):1680–4. Gunther JP, Rorich RJ. Management of the deviated nose. The importance of septal reconstruction. Clin Plast Surg 1988;15(1):43–55. Papel ID, Larrabee W, Holt G, et al. Rhinoplasty. In: Papel I, editor. Facial plastic and reconstructive surgery. 2nd edition. New York: Thieme Publishing; 2000. p. 205–8. Tardy ME, Toriumi DM. Philosophy and principles of rhinoplasty. In: Papel LE, Nachlas NE, editors. Facial plastic and reconstructive surgery. New York: Thieme Publishing; 2000. p. 278–94. Gunter JP, Friedman RM. Lateral crural strut graft: technique and clinical applica-tions in rhinoplasty. Plast Reconstr Surg 1997;99(4):943–52 [discussion: 953–5]. Toriumi DM, Josen J, Weinberger M, et al. Use of alar batten grafts for correction of nasal valve collapse. Arch Otolaryngol Head Neck Surg 1997;123(8):802–8. Tardy ME Jr, Becker D, Weinberger M. Illusions in rhinoplasty. Facial Plast Surg 1995;11(3):117–37. Farkus LG. Asymmetry of the head and face. In: Farkus LG, editor. Anthropometry of the head and face. 2nd edition. New York: Raven Press; 1981. p. 102–11. Vuyk HD. A review of practical guidelines for correction of the deviated, asym-metric nose. Rhinology 2000;38(2):72–8. Powell N, Humphreys B. Proportions of the aesthetic face. New York: Thieme Stratton, Inc; 1984. p. 110–105. Murakami CS, Larrabee WF. Comparison of osteotomy techniques in the treat-ment of nasal fractures. Facial Plast Surg 1992;8(4):209–19. Goodman WS, Charles DA. Technique of external rhinoplasty. J Otolaryngol 1978; 7:13–7. Shah AR, Miller PJ. Structural approach to endonasal rhinoplasty. Facial Plast Surg. 2006;22(1):55–60. Toriumi D, Ries W. Innovative surgical management of the crooked nose. Facial Plast Surg Clin North Am 1993;1:63–78. Constantian M. An algorithm for correction of the asymmetric nose. Plast Reconstr Surg 1984;83:801–3. Anderson J. Straightening the crooked nose. Trans Am Acad Ophthalmol Otolar-yngol 1972;76:938–45. Sheen JH. Spreader graft: a method of reconstructing the roof of the middle nasal vault following rhinoplasty. Plast Reconstr Surg 1984;73:230–9. Over 50 Medical Articles Published throughout the most notable medical journals.